Only in England would the leader of a political party announce he plans a coup to overthrow the democratically-elected government, in the Daily Telegraph, two days in advance. If they [the Tory press] can possibly get away with it, they will find any way they can to declare Cameron the winner, even if it’s going to be almost impossible for him to command a parliamentary majority. 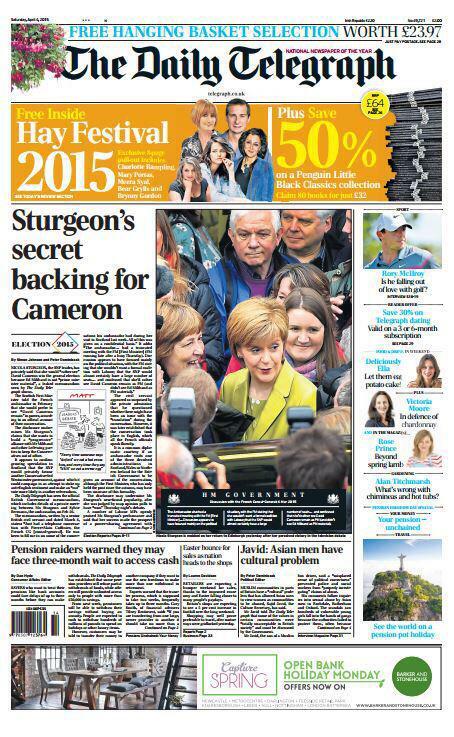 In doing so, they will seek to make it impossible for Miliband to govern. 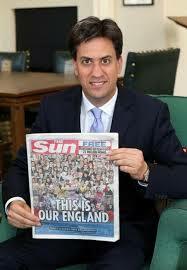 This circumstance would in effect be a coup by newspaper proprietors against the people of the country. Because our constitution is written not in statute, but headlines, this is perfectly possible. It’s complicated by the fact that until a new government is formed, Cameron and the other Tory and LibDem Ministers remain in Downing Street as a caretaker government, even if they have lost their seats and aren’t MPs any longer. 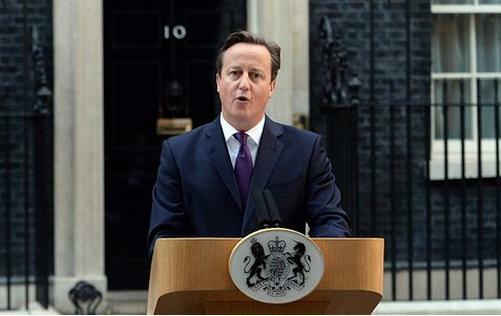 Just as Gordon Brown correctly remained in Downing Street as Prime Minister until Cameron and Clegg had finished their coalition deal, so must Cameron stay on as PM until the House of Commons decides how to form a democratically-elected government out of the results of the 7th May election. Nicola Sturgeon is – as we know in Scotland – an experienced, able politician, with ten years experience as the leader of the Opposition, as the Deputy First Minister, and now as the First Minister, in Holyrood. A Yougov panel of undecided voters failed to recognise Nicola Sturgeon at all when shown her photo in advance of the leaders’ debate on 2nd April: but after the leaders’ debate, Sturgeon was topping UK-wide polls, her results comparable to those for Miliband and Cameron. Nicola Sturgeon spoke as older voters will remember Labour politicians once speaking – of an economy that should support the people, against people being ground up by austerity to “support the economy”, of concern for immigrants and asylum seekers as human beings. Ed Miliband and David Cameron both looked scripted: Miliband constantly turned to speak to “you at home”, not to the audience or to his six fellow debaters: Cameron seemed to have a checklist of things he’d been told to repeat when he was stuck for answer, and he was stuck for an answer a lot. Vince Cable just made me laugh. that it would be inconceivable for the Liberal Democrats to agree to any post-election deal involving the Scottish National party after the general election. On 8th May 2015, a fairly sure prediction is that the LibDems will have lost half of their MPs, perhaps more. While nothing is certain, it’s looking quite likely that the SNP will have gained 30+ MPs and that the SNP, not the LibDems, will be the third-largest party at Westminster. Electoral Calculus currently predicts Labour to have 301 MPs, the Tories to have 262, the SNP to have 46, and the LibDems to have 17. Either Labour or the Conservatives would have to find 326 MPs to support their government. On the face of it, then, it doesn’t matter what the LibDems want: they won’t have enough MPs to give Labour a majority, let alone the Conservatives. Nothing is certain. The prospect of the SNP as the third party in UK politics is so unwelcome to Labour, Conservatives, and LibDems, that if the LibDems are a viable partner for a Labour coalition, I think that both Miliband and Cameron would prefer that to the SNP. 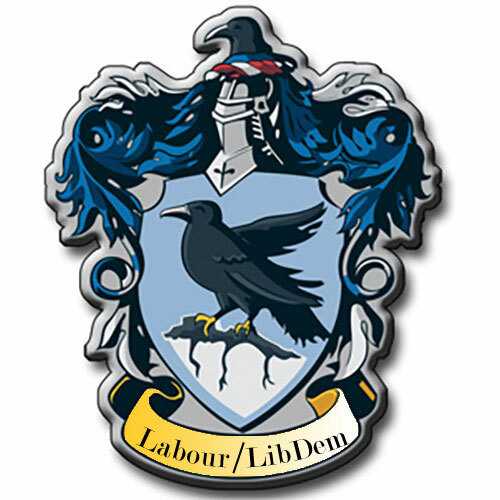 If the LibDems and Labour both do even slightly better than current polling predicts, they might be able to reach the magic number and sign up to Ravenclaw. You may think I’m being over-cautious here. A YouGov poll released yesterday makes things look even worse for Labour in Scotland. But where I think the LibDems are likely to do better than expected is in southern England, where voters will have effectively to choose between the LibDem incumbent and the Tory and UKIP offerings. I think it very likely that in Scotland the LibDems will be left with only one MP, Alistair Carmichael. 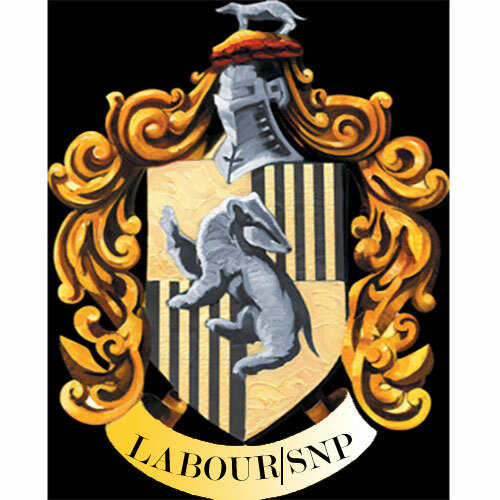 The Ravenclaw coalition would be an English affair with hardly any Scottish representation, and it would validate the swing to the right on the part of both Labour and the LibDems, leaving the left-wing majority almost as unrepresented at Westminster as we have been since the LibDem swerve in 2010, and the Scots more unrepresented at Westminster than we have been since John Major’s time. Scotland could become, like Northern Ireland, a country within the UK that sends an entirely distinct group of MPs to Westminster. The “Clegg’s Law” that the LibDems have tried to promote, that the third party in Parliament should always offer a coalition deal to the party with the largest number of MPs, never corresponded to UK Parliamentary procedure: it was a face-saving excuse to the left-wing supporters of the Liberal Democrats for Nick Clegg and Vince Cable’s plunge to the Tories in 2010. But supposing the LibDems do as badly as predicted, or even worse – Sheffield Hallam is a predicted hold for the LibDems, but there is a concerted campaign led by student activists to unseat Nick Clegg from his constituency. A coalition minority government between Labour and the LibDems may seem unlikely, but two things make it unwise to rule Ravenclaw out of the picture completely. The first is, the artificial stability created by the Fixed-term Parliaments Act 2011. This Act removes the Prime Minister’s power to set a date for a General Election at the time most convenient for his party, but also makes it more difficult for an incumbent government to lose power. The next General Election after 7th May will be held on 7th May 2020, unless the government formed after this general election loses a vote of no confidence or unless 434 MPs (a two-thirds majority of the Commons, including any vacant seats) vote to dissolve Parliament. The second is, that as the SNP have already publicly committed to supporting a Labour government, Ed Miliband might risk forming a Labour-LibDem coalition as a minority government, calculating that the SNP would still support that coalition on most policies and certainly wouldn’t vote with the Tories. What if Labour and the Conservatives formed a coalition? They would have an overwhelming majority in the Commons: this would put paid to any presumptuous ideas the Scots might have that being in the UK lets us have any influence on the government: and it would – which I have some sympathy with – ensure the UK wasn’t in the odd situation of a party which gains less than 5% of the national vote being a large part of the national government. Aside from that, a Labour/Conservative coalition has absolutely nothing in it for either party: prolonged for five years, Ed Miliband and David Cameron would die like the Kilkenny cats, and both parties would end up hemorrhaging votes and supporters. The leadership of both parties have definitively ruled it out. A handful of Labour’s people have suggested that they’d rather partner with the Tories than the SNP. One MP, Gisela Stuart; a peer, Lord Moonie, and most seriously, John Mills, Labour’s largest business donor, who gave Labour £1.65m in 2013. Labour and the Conservatives were on track to finish “about neck and neck” on the basis of recent opinion polls, creating the possibility of a hung parliament and a second contest. If this fails to lead to a decisive victory, Mr Mills said that working with the Tories would be preferable to a deal with the Scottish National party or the UK Independence party. 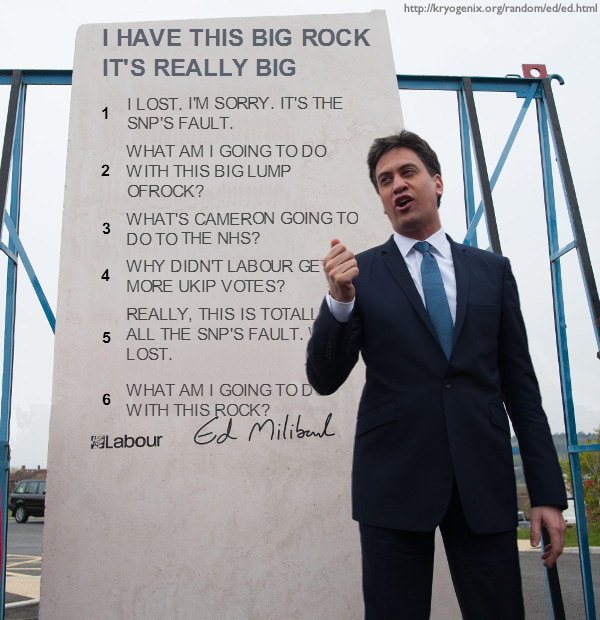 The two things that a grand coalition could accomplish that both Ed Miliband and David Cameron would be likely to agree on, would be to ensure that the SNP are not an effective part of Westminster government, and to change the voting system of the UK so that never again can a party polling less than 5% of the national vote hope to get over 16% of MPs in the Commons. 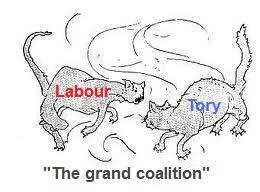 They could then agree that their MPs should dissolve the grand coalition (Labour and Tory together would have the supermajority required by the 2011 Act) and end the 7th May Parliament, holding the next general election after a referendum in which proportional representation is campaigned for by Labour and Tories. Labour won’t agree because there is no benefit to Labour, when they can be reasonably certain of being in government, even minority government, with no way for the Conservatives, whether acting alone or in partnership with UKIP, to force a general election on them. That this plan keeps being mooted is evidence that it would certainly be preferable to the Tories than to return to Opposition with no prospect of winning a General Election for the foreseeable future: the Tories have not won a majority in the Commons since 1992. 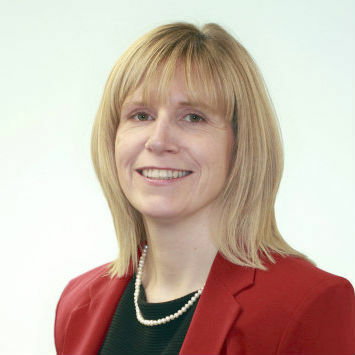 Does Lesley Brennan stand a chance as the Labour PPC in Dundee East? Electoral Calculus says no – Stewart Hosie has both the benefit of being the incumbent MP and the candidate on the rising tide of SNP votes. Maybe in 2020: Lesley Brennan has represented Dundee’s East End ward since 2012. Nevertheless, Dundee East has been selected as one of 106 Labour “battleground seats”, and thus Brennan’s campaign became the recipient of £1000 from Tony Blair, who is donating £106,000 to the candidates in those seats, or so the initial publicity made it seem.